Two Lockheed P-38 Lightnings outrun a summer thunderstorm as they fly below the weather and over the majestic landscape of the Grand Canyon. The P-38 was manufactured by Lockheed aircraft company in Burbank, California during World War II. The airplane flew with Army Air Corps units in both the Pacific and European theaters. These particular Lightnings are on a ferry flight to the US East coast to then be shipped by sea to fight against Nazi Germany. 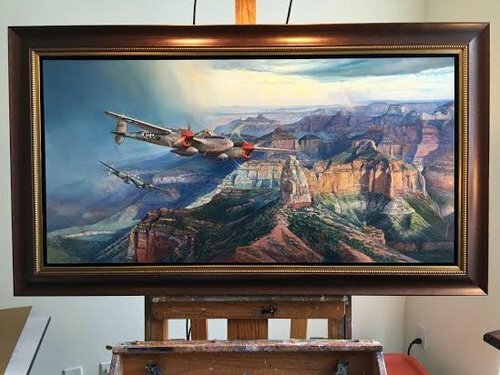 The lead airplane in the painting is P-38-L serial number 44-24630 and would serve with the 367th Fighter Group in France in 1944. The airplane became the personal mount of the units commanding officer, Colonel (Later General) Edwin S. Chickering.